Nissan was a wealthy man who lived in Yargin, a small town near Pressburg, the capital city of Slovakia. When younger, he had been a student at the famous Pressburg yeshivah. He and his wife were already married for many years, but still had not been blessed with children. When, finally, a son was born to him in 5583 (1823), it was no surprise that he honored his former teacher, the world-renowned scholar known as the Chatam Sofer, to perform the circumcision. Unfortunately, the brit had to be postponed because of the weak health of the baby. It wasn’t till several weeks later that it was announced that it would take place on . . . Purim! The baby was given an appropriate name for a Purim brit: Baruch Mordechai, which means “blessed be Mordechai,” from the paragraph recited after the megillah readings. The child grew. At an early age, he was already outstanding in character and religious observance. However, much to the distress of his parents, his ability to understand Torah was not at par. As a boy, he didn’t seem any different than his age-mates; but after his bar mitzvah, when he entered the famous Pressburg yeshivah, it was noticeable that he was having major difficulties in his studies. In truth, he was very diligent. He would sit absorbed in the holy books from morning to evening. But whenever he was asked to repeat or explain anything, he was unable to respond, and could only sit silently. His less-sensitive classmates liked to make fun of him because of this. Once, when he left his place for a few minutes, they switched his volume of Talmud for one of another subject entirely, leaving it open to the same number page he had been on. When he resumed his seat, he didn’t seem to notice the difference at all. When Baruch Mordechai turned eighteen, the Chatam Sofer’s son, known as the Ketav Sofer (who had succeeded his recently departed father as the head of the yeshivah) advised Baruch Mordechai’s parents to send him to the Land of Israel. Perhaps there, where “the air of the Holy Land makes wise,” his studies would prosper. His parents decided to do it. They hoped it would also enable him to make a good match. One of the scholarly leaders of the Jerusalem community then, Rabbi Yeshaya Bardaki, “adopted” Baruch Mordechai, concerning himself with all of his needs. He was impressed with the young man’s sterling character and piousness, but he could not fathom how someone who had done nothing but study Torah diligently all his life could have retained so little. When Baruch Mordechai reached age twenty, Rabbi Bardaki found a bride for him: a simple girl from a good family in Jerusalem who wouldn’t mind that her husband was an ignoramus. 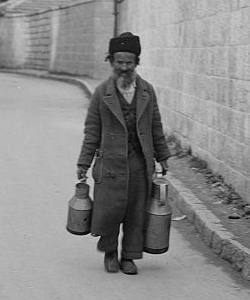 Several years after the wedding, Baruch Mordechai began to work as a water-carrier. He was honest to a fault, and as a result quickly became very popular. Every Rosh Chodesh (first of the month), he would deliver water to his regular customers for free; he worried that over the course of the previous month water might have spilled, whereas he had charged for full buckets. For more than forty years Baruch Mordechai toiled at his chosen profession, the whole time in joyous spirit and with gratitude to G‑d for his lot. He took special satisfaction from serving the many Torah scholars within the walls of Jerusalem; he considered this a great merit, and refused to accept payment from them. It anguished him that the great scholar Rabbi Yehudah Leib Diskin refused to take water from him. “I cannot allow myself to be served by the likes of Reb Baruch Mordechai,” he would say—but refused to explain his words. On Purim 5653 (1893), at the time of the festive meal, most of the chassidim and notables of Old City Jerusalem crowded, like every year, into the home of Rabbi Schneur Zalman Fradkin of Lublin, the celebrated author of the scholarly book Torat Chesed. The atmosphere was exceptionally joyous, even for a Purim celebration. Everyone was constantly erupting into lively song and dance, and there was a complementary flow of wine and wise words. Everyone smiled tolerantly, figuring that such an outburst from the simple water-carrier could only be a result of all the Purim wine he had imbibed. Immediately a large tumbler of a special strong wine was poured and passed to Baruch Mordechai, who speedily dispatched it as commanded. It had an immediate effect. The elderly water-carrier began to sing and dance energetically. Suddenly there was silence. Everyone’s gaze shifted in amused anticipation to the tipsy Baruch Mordechai, as he climbed up to stand on the table and began to speak. But then, all the grins slowly gave way to wide-eyed stares of astonishment as it penetrated their ears that the water-carrier was discoursing enthusiastically on scholarly Purim topics, and peppering his words with learned citations from the Talmudic tractate Megillah and a variety of midrashim and works of Jewish law. And he waxed on and on! Indeed, if the strong wine hadn’t finally taken its toll, it seemed that he could have continued indefinitely. Even before the holiday was over, the news of the extraordinary scholarship of the unassuming water-carrier had spread throughout Jerusalem. The community was in an uproar. How had they allowed such an accomplished scholar to be disdained in their midst, and to labor as a mere water-carrier for so many years? And how had his erudition remained hidden for so long? A few of the elders of the community recalled hearing of the mysterious words of the Chatam Sofer seventy years before. Now, some clever minds were saying, they could finally be understood. Nichnas yayin, yatza sod—“Wine enters, secrets emerge.” Yayin (wine), spelled yud-yud-nun, has a numerical value of seventy, and so does samech-vov-dalet, the Hebrew word for “secret”! The Torah giant Rabbi Moshe Schreiber [1762–1839] was known as the Chatam Sofer, after the title of his volumes of responsa which have been highly significant in the modern development of Jewish law and thought. Who Are the 36 Hidden Tzadikim? Purim Secret I listened to a speaker who deemed Purim the most important holiday, more important than Yom Kippur. He noted that Yom Kip pur had Pur-im in it, and made the argument that we wear masks and it has something to do with Hashem's hidden nearness to us. I always treat Chanukah as the most important because without the victory of the Macabees Judaism would have been wiped out. Hopefully everybody has their own most important. It all counts as Torah learning. This year via Chabad.org i am learning a bit about hiddenness. I am in no rush but it is on my radar. 2. The Rabbi I described may have that title, but he is best off teaching people who want to get back to some degree to their Jewish heritage. 3. I am not sure that you understood my simplistic story. Why would quote the Rabbi. He was incorrect what he was teaching. He needed to be corrected not quoted. Hebrew text of this story? Is it possible to find the Hebrew text of this story somewhere? I want to share it with some people who will understand it better in Hebrew than English. Thanks so much for such an uplifting story! great story Hi Rabbi- Apart from the great story, i was caught by your askance about a translation that was yours. It is human nature on a personal level to want recognition if one's work is being used.During a lesson, i once corrected a rabbi on a simple point he answered incorrectly. The next session he used my answer without mentioning anything about my teaching it to him. On this evening i seethed. I would not participate in the evening's lesson. At the end the rabbi asked me by way of challenge if i wanted to lead the next week's lesson. I said yes. He was dumbfounded. That whole week the rabbi was very nervous and tried to get me to change my mind. I would have none of it. I told him that i had prepared the lesson, and was most certainly going to deliver. And deliver i did and received compliments on it. The evening went on very long and the discussions were very animated. Olomeinu Probably it was a different rendition.